Equivalence, insensitivity and monotonicity are important properties of queueing network models that can be used in system performance comparison and evaluation. Insensitivity and equivalence properties provide the basis for comparing the performance of system models with different parameters and with different blocking mechanisms. These results can be applied, for example, to study the impact of the blocking type on system performance, by considering a given set of performance indices and network parameters. In particular, equivalences allow us to define more efficient algorithms to evaluate queueing networks with blocking and to extend the class of models that can be analyzed through analytical methods. Insensitivity properties lead to the identification of the factor that affect system performance and in certain cases it allow a generalization of solution methods. Some important consequence of these properties is that solution methods and algorithms already defined for a certain class of networks could be extended to other classes of networks with different blocking types and/or network parameters. 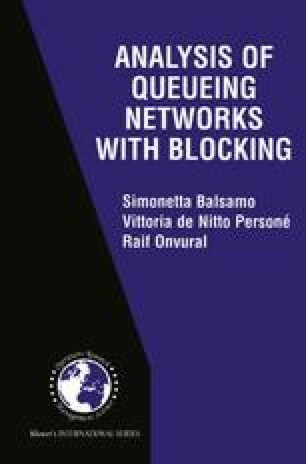 For example, equivalence between networks with and without blocking immediately leads to the extension of efficient computational solution algorithms defined for BCMP networks such as MVA and Convolution algorithm to queueing networks with finite capacity queues. Monotonicity provides insights in the system behavior represented by the queueing network models.